Dust Bowls Aren't Just An 'Interstellar' Thing : Goats and Soda The new movie starts off with Earth ruined by dust bowls. And that's not just sci-fi. 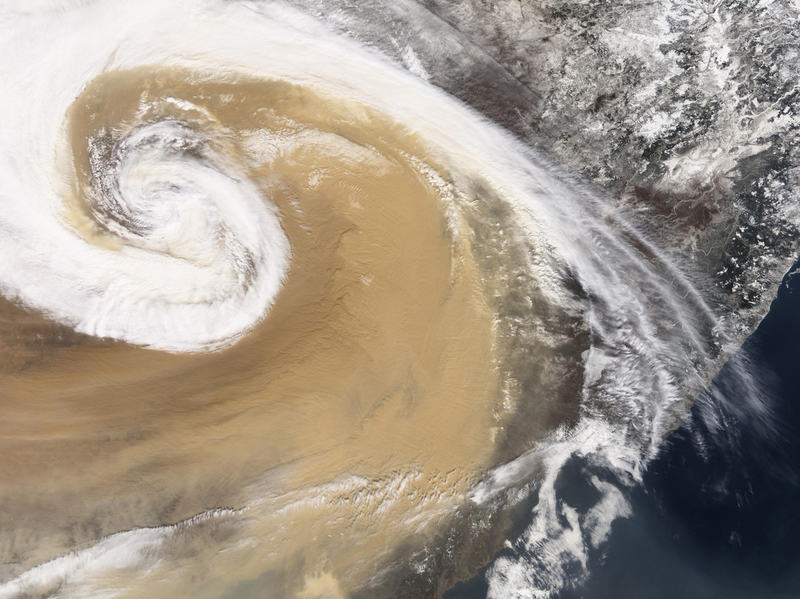 A couple of major dust bowls are brewing right now, in China and Africa. And goats may be partly to blame. A 2013 sandstorm hits Shandan Horse Ranch in Zhangye City in northwest China's Gansu province. At the start of the new movie Interstellar, the Earth has become one big dust bowl, plagued by failing crops and lung-clogging air. The only hope for the human race is to find a new planetary home in some distant star system. It's science fiction with an uncomfortable ring of truth, emphasized by bits of historical footage from Ken Burns' documentary about the very real American dust bowl of the 1930s. That dust bowl was largely a manmade ecological disaster, brought on by plowing too much of the prairies. And it could happen again. In fact, in some parts of the world, it already has. Two new dust bowls — regions of formerly productive land now crippled by prolonged drought and dust storms — have been developing in China and northern Africa over the past few decades, says Janet Larsen, director of research for the Earth Policy Institute. A satellite captured a 2001 dust storm swirling over China. The storm eventually crossed the Pacific and reached the United States. In China, dust storms have become almost an annual occurrence since 1990, compared to every 31 years on average historically. 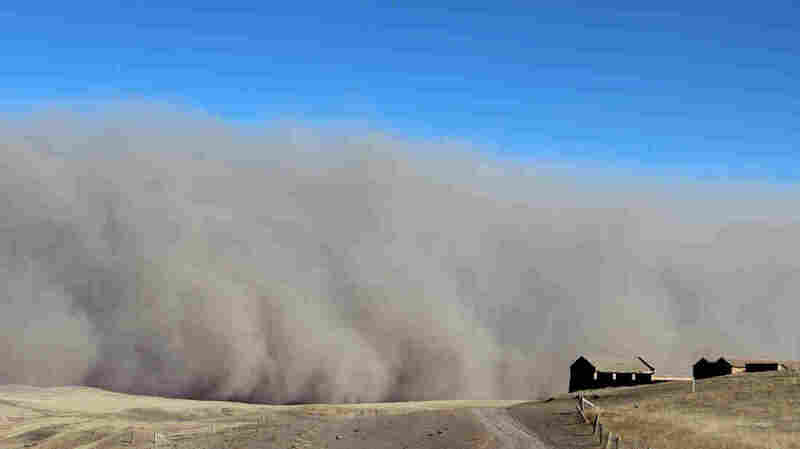 In northern China and Mongolia, two large deserts — the Badain Jaran and the Tengger — are expanding and merging, often swirling together in massive sand storms when strong winds blow through each spring. The Gobi desert is also growing, inching ever-closer to Beijing as the grasslands at its edges deteriorate. Meanwhile, in the Sahel region of Africa, millions of acres are turning to desert each year in countries including Burkina Faso, Chad, Niger and Nigeria. Dust from Chad's Bodele Depression been traveling the globe for many centuries — in fact, scientists think it helped make the Amazon fertile. But the amount of dust blowing out of West Africa has increased in the last 40 years. Dust clouds from the Sahara can affect air quality as far away as Houston, and may even harm Caribbean coral reefs. The main culprit behind both of these new dust bowls? Overgrazing, says Larsen. "These are areas where the situation has worsened because of soil erosion, largely because of herders running more livestock over the land than the grass can sustain," says Larsen. When too many animals are grazed in the same area for too long, they destroy soil's protective crust and eat or trample all the vegetation, leaving nothing to anchor the soil when the wind blows. Grassland turns to wasteland. Desertification is a silent, invisible crisis that is destabilizing communities on a global scale. As the effects of climate change undermine livelihoods, inter-ethnic clashes are breaking out within and across states and fragile states are turning to militarization to control the situation. The effects of desertification are increasingly felt globally as victims turn into refugees, internally displaced people and forced migrants or they turn to radicalization, extremism or resource-driven wars for survival. And as painful as it is for a blog called "Goats and Soda" to publish this, we must report the news: According to Larsen, goats can be a bellwether of desertification. When a country's total livestock herd starts to change in proportion — more goats, fewer sheep and cattle — it probably means there's less good stuff growing on the land. "Goats are hardier creatures than sheep or cattle; they eat everything. They'll even eat each other's hair! As the grasslands deteriorate, goats can still forage on shrubs," says Larsen. Goats can also cause more soil damage, since their hooves are sharper than sheep or cattle, she adds: "So when you see a big increase in goat numbers, it either means there's trouble, or trouble's coming." China's goat population doubled between the mid-1980s and mid-1990s, and continues to grow, surpassing its sheep and cattle populations and reaching 151 million goats as of 2010, notes Larsen. This "goat effect" is also evident in Nigeria and other African countries where desertification is increasing. Both China and Africa have embarked on grand greenbelt initiatives to fend off their dust bowls, planting billions of trees at the edges of the advancing deserts. Larsen is skeptical that this approach alone will prove effective, since water to nourish the seedlings is scarce in many of the affected areas. She's more encouraged by more balanced grazing and farming practices. "Land can be restored from desertification — we did it in the United States after our dust bowl," she says. "But it's very, very difficult. That's why prevention is very important, especially as climate change brings on more extreme droughts. Without good land management practices, [the U.S.] could easily find itself in a dust bowl again." Meanwhile, is Larsen going to see Interstellar? Probably not, she says: "I see enough dystopia in reality."